Clarkesworld Books closes tonight at midnight. I’m disabling the shopping cart and leaving the site as a resource for book dealers who are looking at picking up some of my inventory, but it will be effectively closed for the first time in nearly 8 years… and it’s difficult. We’ve been receiving a steady stream of orders today from some of our longtime customers and even a few newcomers. I’ve been telling people that if there are books they want, but can’t afford right now, I’ll hold stuff for them. That offer extends to everyone. Any authors who want to pick up copies of their books at a good price are encouraged to drop me a line. I’m sure I can work something out for you. There is a lot of inventory left and that will be sold off to dealers, placed on ebay, or sold at conventions. I’m also keeping my Clarkesworld yahoo group/mailing list going for now. I’m finding all sorts of things as I clear out boxes and will post special offers and interesting finds there from time to time. It’s just not going to be the same though. You have my condolences and my congratulations on moving to a new phase in your life. 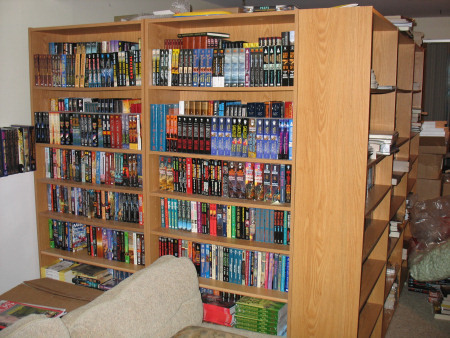 I just placed an order, and have a dozen or more books I still want….geez, maybe a hundred more. Your store will be missed more than you could imagine. Wyrm will be your phoenix, arising to the heavens once again! All the best in your future endeavors Neil!! I’m sad too. Best of luck with Wyrm and the magazine! It’s weird not getting some Talebones copies boxed up to send ya. Good luck with your new ventures!